If you wanted to see an offensive showcase for Super Bowl 52, you got your wish. 1,151 total yards combined by both the Philadelphia Eagles and the New England Patriots. That is the most in any NFL game ever played. Chances are with the way the game is being played today, it will be broken sooner rather than later. That’s just one example of the offensive showcase. The other is the fact that there was only one punt the entire game. The Eagles were responsible for it. Not a single sack was allowed until the end of the game when Tom Brady was sacked and fumbled the ball thanks to Brandon Graham of the Eagles. Brady made history again with 505 passing yards, breaking his record from last year that was 466. Eagles QB Nick Foles, who was named the MVP, threw for 373 yards and 3 touchdowns. Oh, he also caught a touchdown pass on 4th and goal just before the end of the first half. Foles’ only blemish was an interception that wasn’t his fault as it was tipped in the air by his receiver Alshon Jeffery. Three Patriots receivers had over 100 yards receiving and the Eagles had their major playmakers involved early and often. This Philadelphia franchise has had a lot of disappointing finishes throughout their history. It could have happened again this year, but the Eagles were playing with a kind of confidence that I haven’t seen in my lifetime. They used the ‘underdog’ tag to their advantage the entire playoffs which is funny considering they finished the season with the best record in the NFC at 13-3. There was doubt and rightfully so with their starting quarterback Carson Wentz lost to an ACL injury well before the playoffs started. 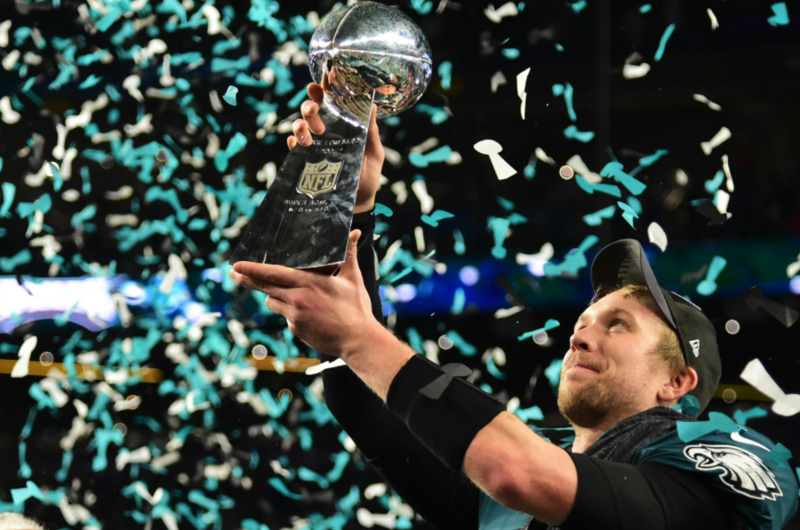 Credit to Nick Foles for playing extremely well and putting together one of the best performances by a quarterback in Super Bowl history. The Eagles defense was kept out of Tom Brady’s way until it mattered most. All it takes is one play to make all the difference. Congratulations to the Philadelphia Eagles on their first Super Bowl title in franchise history.